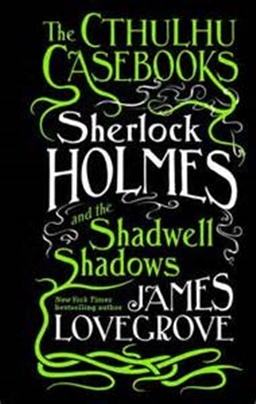 Also, Watson seems particularly harsh towards Holmes in this book – not something I noticed in Shadwell Shadows. The only reason I deduced was because he blamed Holmes for Mary Morstan Watson’s death. That’s probably incorrect, though. Which leads us to something I like about the series. Lovegrove gives us alternate versions of the whitewashed stories that Watson published as the official Canon. For example, the Baskerville hound was really an interplanar creature that Holmes and Watson attempted to send back via a portal on the Grimpen Mire. The Sign of Four was similar but still quite different from the version found in Lippencott’s. And Mary’s death – well, some ailment such as tuberculosis would have been a much better way for her to go. Other cases and events found in the Canon are given alternate, and always terrible, explanations. Professor Moriarty is far more of a villain than was found in the pages of The Strand. The author doesn’t beat you over the head with a nonstop succession of references, but they are sprinkled throughout the two books so are and are deftly handled. I’d like to see Lovegrove flesh out some of those affairs in short story form. Now there’s a collection for Titan to put out! 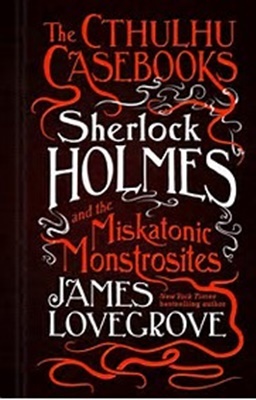 Aside from the extended journal journey, the book resembles the first in that it should appeal to Holmes fans who like horror or Cthulhu fans who also like Holmes. Lovegrove clearly knows his Cthulhu and frames the premise well. The opening chapter combines horror and action and sets the tone from the outset. Finally, I love the look and feel of the covers, which are almost embossed. They look great. Though this one was too much Cthulhu and not enough Holmes for me, I will be reading the trilogy’s conclusion next December. In last year’s post I also looked at Lovegrove’s The Stuff of Nightmares. I make it a two-fer again with The Thinking Engine. That book opens with a mummy pursuing Holmes and Watson. Lovegrove likes to grab the reader’s attention: No sitting in the lodgings at Baker Street as a client oscillates upon the pavement here (name that story!). There’s a notable guest appearance in an even that’s not quite as irrelevant as it seems and we move into the main story in chapter three. A professor at Oxford has built what is essentially a supercomputer. 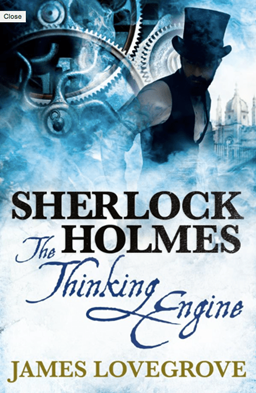 It’s a thinking engine that is Holmes’ equal at solving crimes. A newspaper magnate puts up a substantial sum to pit Holmes versus the Engine to get to the bottom of a local murder. Both contestants come up with the same answer. More deaths follow and clearly there is something nefarious going on in the university town. Familiar names surface and Holmes continues his battle with The Thinking Engine to the end. While I liked the premise, I wasn’t enamored with the last several chapters. I would have much preferred a different villain. Even the one who was falsely identified before the real one was unmasked would have worked a bit better for me. While there were parts of this book I liked, I preferred The Stuff of Nightmares. Lovegrove’s Gods of War is on my ‘To be read’ shelf, so we’ll see how that one, featuring an older Holmes, shapes up for me. I also purchased The Labyrinth of Death over the weekend and I like the description. So, while I wasn’t quite as big a fan of these two books as the pair I reviewed last year, I’m still a Lovegrove fan. And next December, look for my thoughts on Sherlock Holmes & The Sussex Sea Devils, along with another of Lovegrove’s tales about the great detective. Bob Byrne’s ‘The Public Life of Sherlock Holmes’ column ran every Monday morning at Black Gate from March 10, 2014 through March 20, 2017 (making an occasional return appearance!). He also organized Black Gate’s award-nominated ‘Discovering Robert E. Howard’ series. He has contributed stories to The MX Book of New Sherlock Holmes Stories – Parts III, IV, V and VI and will be in IX if he quits having fun writing Black Gate posts and works on a story! I hope Mr. Lovegrove does justice to both Doyle and Lovecraft. I’ve purchased and/or read a lot of Holmes material not written by Doyle, much of which was quite readable. But could I say the same of Lovecraft? Not so much. In the last 15 months or so I’ve picked up a LOT of Lovecraft-inspired stories, novels, and collections, and ONLY Victor LaValle’s “The Ballad of Black Tom” has been worth the time or money spent. To be fair, I haven’t yet gotten to S. T. Joshi’s “Black Wings of Cthulhu” volumes; I’m hoping they’ll make up for the rest…. smitty59 – I haven’t read much Cthulhu outside of Lovecraft and Derleth, but from my limited viewpoint, Lovegrove seems to do it well.